Free Shipping Included! 2018 Leelbox Q3 4K Android 7.1 TV Box 64Bit S912 Octa-core CPU 2GB Ram+16GB Rom 1000M lan Supporting 4K (60Hz) Full HD/ H.265 /2.4G+5G Dual-Band WiFi/BT 4.0 by Leelbox at Kool Heads. MPN: M8S MAX 001. Hurry! Limited time offer. Offer valid only while supplies last. Leelbox Q3 android tv box, S912 Octa-core cortex-A53 @ 2.0G, Android 7.1 both Wifi 2.4GHz and 5.0GHz, 2GB DDR & 16GB emmc Flash and BT 4.0. 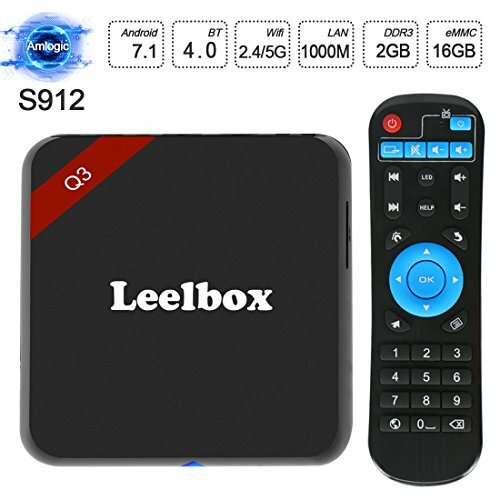 Leelbox Q3 android tv box, S912 Octa-core cortex-A53 @ 2.0G, Android 7.1 both Wifi 2.4GHz and 5.0GHz, 2GB DDR & 16GB emmc Flash and BT 4.0. Leelbox Q3 has a year of warranty. Please DO CONTACT our customer service when you have any problems on using the boxes. We are professional, hoping to offer you the best service. [1000M Lan + Super S912 CPU] Q3 support 1000M LAN,better than others Top configuration 100M Lan. It installed with S912 Octa-core cortex-A53@2.0G (CPU) and Mali-T820MP3(GPU), which is way ahead in image processing and computing. Its high machine configuration gives you ultra-fast running speed and professional image processing ability.make sure you will enjoy your free time. [2GB memory + 16GB internal storage ] Q3 has 2GB memory which strengthen the running speed of the box. It supports 1000M internet speed, And it has 16GB ROM. if you want to expend the storage, you can use USB of 8GB, 16GB, 32GB and 64GB.With double wifi and 1000M lan+16GB memory,Q3 help you watch 1080P no buffering. [High chip] S912 Octa-core have real eight-core chips from Leelbox unlike other S905X, S905W, RK2332 four-core chips system, Android 7.1 Marshmallow OS and 16GB EMMC Flash from Leelbox, Q3 could run 5 more times faster than other android tv box, many games, play unlimited movies, TV shows, music without freezing and buffering. [Stable, Fast and High Quality WIFI signal]Original 16GB EMMC Flash makes Q3 10 times faster than other TV box on data reading and storage. Leelbox fastest Dual-band wifi which supports 5.0Ghz and 2.4Ghz: To run the box without any delay or buffering. Come With Newest Android operating system android 7.1.Which provide more stable system . [BT 4.0] With BT4.0,you can connect mini keyboard, headset and other BT equipments with this box to enjoy your free time. Infrared Remote Control Receiver Module Design make it no need to press the button of remote control face toward the tv box.